I’ll be going camping and will catch up with you all and the blog when I return (whenever that may be!). To the doors of our ancestors. To who and why we are. I love old photographs. I try to describe or say who is the photographs I take, or else there will be generations to come saying “Who is that?”, like I have done over the years. That’s if they look at them as we don’t have children. It’s good to tackle that labeling even if you don’t have kids(as we don’t either). You never know who might be interest in the future. Sometimes the people who have the photos don’t even know who is in them, but when I collect enough from various sources, I can start to figure them out. Very true about who may be interested. There are always people in every generation who are interested in genology and history. “flipping through the pages”, your haiku caught the eye. Good thing; the photos are great. Thanks! There’s such a collection that I need to sort through, organize and label. It’s daunting. Definitely thought provoking. I’ve never done much heritage digging, mainly because I never had anyone ignite that spark and/ or give me any basic building blocks. 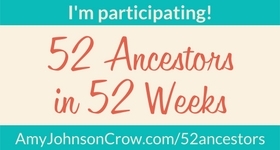 Is there a genealogical society or DAR chapter in your area? They would happily get you started. Online resources have come a long way in just the past few years. You might be surprised what you can find just sitting at your computer.